All City students, including students from Cass Business School, Health Sciences, Mathematics, Computer Science, Engineering and Law Schools. Admission Price: Free. Apply now! Calling All (Aspiring) Student Entrepreneurs! Are you looking to solve real-world problems? Have you got a business idea but no team to launch your startup with? Or are you looking for a learning opportunity to increase your employability skills? Cass Business School are inviting all City students to join our awesome CityStarters Weekend and change the world! Have you ever heard of 'hackathons' or startup weekends before? 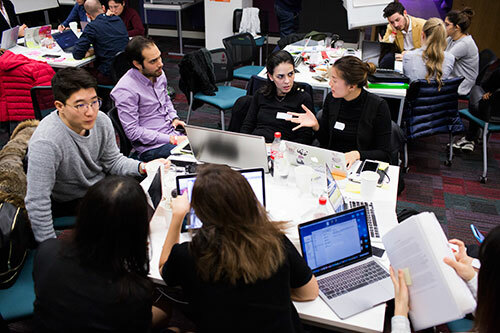 Our CityStarters Weekend is a weekend-long event where all City, University of London students (developers, designers, marketers and startup enthusiasts) will come together to share ideas, form teams, build products and hopefully launch startups. Whether you’re an entrepreneur or an aspiring entrepreneur, come to our CityStarters Weekend 2018, find your co-founder, create something beautiful and build something amazing! Watch last year’s CityStarters Weekend highlights and you’ll definitely want to join us this year! learn about validating your idea, product and customer development, learn startup methods, Minimal Viable products and so much more! last but not least, make your CV stand out and increase your entrepreneurship skills. This event is open to students enrolled at City, University of London in 2018/19. The CityStarters Weekend will start on Friday 26th October 2018 at 6pm. It will continue on Saturday 27th October (9am – 7pm) and finish on Sunday 28th October 2018 (9am – 7pm). The event is free and we would love to invite as many students as possible. However space is limited so please apply as soon as possible as we will invite students on a 'first-come first-served' basis. If your application to join the CityStarters Weekend 2018 is successful, you will be invited to pay a refundable £20 fee to reserve your place. Please apply to join the CityStarters Weekend 2018 by clicking on the 'Sign up for this event' button. It'll only take a few minutes. Good luck! The application deadline for this event is Monday 22nd October 2018, 3pm. Are you the next Sheryl Sandberg or Mark Zuckerberg? Join us on 26th, 27th and 28th October 2018 and make your idea happen! *We have a fantastic group of entrepreneurs and coaches joining us at our CityStarters Weekend. Further details about the event will be available soon.